When the form is submitted the information is emailed directly to you. The Form webapage type is available with Option Packs 2 & 3 – see Options for further information. 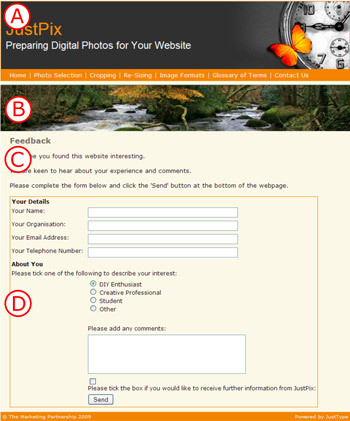 In the example below the Masthead (A), Banner picture (B) and Header (C) are followed by the form (D), which in this case is enclosed in an outline box. The form can contain different field formats such as text input, radial buttons and tick boxes. Full control over the layout, text labels and field format is provided.